Welcome to the 14th student blogging challenge. I hope you all enjoy the activities to choose from each week. Teachers – remember you can adapt the activities to suit what is happening in your class at that time or you can cut and paste parts of it on to your class blog. Just remember to give credit where you found the ideas by linking back to the challenge post somewhere on your post. Students – Each week there will be lots of activities to choose from. You don’t have to complete them all. But by Easter, your mentor or I must see your ‘About Me’ page or post as well as two other posts relating to the challenge. If they can not be found, your name will be taken off the list of students participating, especially if you have been given a mentor. Mentors – they are there to give you some clues about blogging, reminding you of the challenge as well as carrying on conversations in your posts. Remember to read and reply to their comments politely and in a timely fashion. Can visitors leave comments on your blog posts? If your country is in bright pink, then you might need to change your privacy settings. Check this post for how to do this using Edublogs, Blogger and Kidblog. Whenever you meet a new person or join a group, there are three things you will most likely do. Activity 1: Here is a link to the post I use with my online students when they create their user avatars. This includes some great websites for creating avatars. Create your user avatar. Save it to your own computer drive as a jpeg file format no larger than 200 x 200 pixels. You might need to crop and resize. If using Edublogs, check here. If using blogspot, check here. If using kidblog, check here. Teacher might need to change some settings in Kidblog to allow students to add own avatars. Activity 2: Create a series of avatars to represent your family members. Use different avatar websites depending upon the person’s interests. Write a post about your family and include the avatar for each person. Remember – be internet safe, no personal information. This was my very first Animoto created back in 2009. Look at the list of tools on the sidebar for other slideshow creators. Activity 4: Write a post describing your avatar. How much does it look like you? What sort of personality does your avatar have? What makes it typically you? Remember to include your avatar as an image in your post. Activity 5: What are some apps or other websites you could use to create an avatar? Tell me about them, costs, age to use etc Maybe write a tutorial telling how to create the avatar on that website or app. Activity 7: What are some apps or websites you could use to create something interesting to add to your About me page? Tell me about them, costs, age to use etc Perhaps a word cloud or glogster – brainstorm as a class. One important aspect of blogging is commenting on other blogs. Classes and student participants are grouped according to similar ages. Visit some other blogs, read posts, get ideas from them, leave a comment. Make sure you include your blog URL so they can come to visit your blog. Activity 9: Are there other students your age with similar interests to you? Visit them and leave a comment on a post or their about me page. Most students will also have a mentor who will be leaving comments. Make sure you read their comments and reply back to them. In fact, you should reply back to any interesting comments you receive – that is how conversations get started. Leave a comment on this blog post when you have finished your activity or activities for this week. What activity did you do? Why? What did you enjoy about doing the activity? What else could we do regarding about me pages and avatars. Remember to include your blog URL so I can come to visit you and leave a comment on your post. « Could you be a mentor? I have been running the student blogging challenge now for 7 years – I run them in March and again in September each year. The reason is to allow classes and students to connect with each other and have a global audience for their posts. Do you have a class blog? We had heaps of fun doing this, but even more fun giggling at each others! 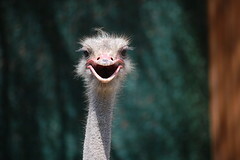 I love the ostrich photo! This Week i have finished activity’s 6,7,8 they were very fun and easy to finish i am looking forward to doing more have a fantastic day..
the sites that you can make avatars on is Voki, wimp yourself, you can go on an Ipad and use WeeMee and on the blog they’re are many more on your blogs. I did activities 1,6, and 9. Hello. some of my class mates are using minecraft including me to build a life cycle of a plant. Come check out our blog. Hello! Here is our 66 student collaborative About Us A to Z post! We hope you enjoy it! I already did my About me post from the last blogging challenge. So this time our class drew names from a container. Once we had the name we drew we did a Tagxedo or Wordle on them. Basically, we did an About me about one of our classmates. Here is my URL https://tatumtle.edublogs.org/. I hope you can visit my blog and you like our way of doing the About me post. HI Miss Wyatt, my name is Jessica. For the week one challenge, instead of doing an about me post about ourselves, we did them about our classmates. We used tagxedo and wordle to do world clouds. I think that you would find them very interesting. Please visit my blog. http://jessicadle.edublogs.org/. Thank you for your time. Hi Miss Wyatt, my name is Jessica. For the week one challenge my class did about me posts about our classmates instead of ourselves. My class made tagxedo’s and wordles about kids in our class. I think that you would find them very interesting. Please visit my blog. http://jessicadle.edublogs.org/. Thank you for your time. Hello, I did this weeks challenge with my class. We did a little spin on it though. Instead of doing about me we did about our classmates. My blog URL is http://cassiemle.edublogs.org/. Hello! I’ve finished the Week 1 Challenge. Our classroom did it different though, instead of doing an about me post (which I already have an about me. Our classroom picked a name out of an container and did an About Them post. Come and check out my blog at: http://alexisble.edublogs.org/ . Bye! I did something a little different since I already had an about me post on my blog. So I did one about someone in my class. Visit my blog at http://bryceple.edublogs.org/ to check it out! We have a number of classes at Iona Presentation PS participating in the Challenge, although we are unlikely to keep up with the ‘weekly’ challenges! Hey check out my blog ( http://isabellewle.edublogs.org/ )and vote for our school to get kindles/nooks for our library!!!! Hey i have finished my about me page at http://isabellewle.edublogs.org/about-me/ . I did 1, 2, 4, and 6. Hope you like them! Visit me http://blogs.csdvt.org/marilynn/. I did activity 1,2,4,and 6. Hope you like them! I have completed activities 1,2,3&4. the reason I completed these activities is because I wanted extra credit and I like the blogging challenges. The part I enjoyed about the challenge was making the avatar. We’ve got a video introduction to our class blog “in progress” that we hope to be able to share this week. In the meantime, we’ve been checking out and commenting on other class blogs that are participating in the challenge and have already begun to make connections! Bring on the week 2 challenge. I did pretty much all the activities. I found it really amazing to do them, especially that they give you the opportunity to experience something new, which will actually improve your knowledge. I’m waiting on pins and needles for the next week’s challenges! Hi everyone I am Dillon and This Is Who I Am! Hi.My name is Will. I have done all the tasks for this week. My blog URL is above. My class and I had fun creating avatars and spicing up our “About Me” pages. We created a Google Slide show that displays our avatars and tells a little bit about who we are. Hope you like it! Greetings. You know that these challenges are as much fun for the mentors as they are for the student participants, right? I finished activities 1 and 6. Here is a where to go to see my blog to check it out. I did activity 1 and 4, and really enjoy them! Please visit my activity 4 post at http://blogs.csdvt.org/penelopej/2015/03/06/my-avatar/. Thanks! this is our first week and so far i have enjoyed the challenge. I tried to leave a comment on your about me page but it wasn’t there. I will leave a comment there next time you invite me to visit your blog. I couldn’t find your about me page, so I will leave a comment on your blog next time I visit. I wanted to leave a comment on your about me page but I couldn’t find it on the sidebar. The theme you have chosen means you need to go to your dashboard> appearance> widgets and drag across the pages widget tot he sidebar area. hi,miss w my name is Caitlin. This is our first week and so far l have enjoyed the challenge. bye! I wanted to leave a comment on your about me page, but I couldn’t find it. On the black theme you have chosen, you need to go to dashboard> appearance> widgets and drag across the pages widget to your sidebar. please come and visit my all about me page blog at http://www.kelly45yps.edublogs.org. Sorry I couldn’t leave a comment but I couldn’t find your about me page. Maybe your teacher hasn’t approved it yet. I will look again next time you ask me to visit your blog. this is are first week and so far I have enjoyed the challenge. I love the student blogging challenge. I couldn’t leave a comment on your about me page because I couldn’t find it. I think on that theme, you need to go to dashboard> appearance> widgets and drag the pages widget across to the sidebar area. I finished week 1 and update my about me. I also added my avatar to my blog. I completed the week one challenge by commenting on people blogs and by doing the avatar and by finishing my about me blog. I did all the things that I needed to do for week 1. My students are working on these challenges today. They are all looking at the list of participating students and finding two people in their age level (not from our school) to read and comment. They are are creating avatars for their blogs. They have already completed About Me pages last month, but I’m having them revise and update their About Me pages so that they are more intriguing, detailed, and interesting to read by others. I’ve asked them to reply to this blog post when they are done with all of these challenges to verify that they have completed them! I just did activities 1 and 2. I still need to finish improving my about me page. i completed the first 3 activites and week one of the challenge. I finished the week 1 challenge. I completed the challenge. I made an avatar and made 2 comments. I completed week 1’s challenge. I visited two other blogs and commented on one of their posts. I enjoyed this challenge because we got to learn about other people through their blogs. I completed my week one challenge. I finished my avatar, about me page, and commented on two posts. I commented on two other blogs and had created my avatar. My favorite activity was commenting on the other blog’s and reading and learning about each person who’s blog I commented on. I’m really enjoying the Student Blogging Challenge. I’ve accomplished your first challenge. Here’s a link to how to get to it: http://phillipmast.edublogs.org/. By the way how do you make a live link on a comment? If you check out this post by Mrs Yollis in California, she shows you how to create a hyperlink or a live link. We completed activities 6, 7 & 9. The students have loved visiting other class blogs and learning about students the same age around the world! They were very excited when we received comments from New Zealand and USA. We used a simple and free app chatterpix to add a simple animation to our ‘class mascot’ and added to our about us page. If I do activity one, do I have to do any other activities? You can do as many of the activities as you want to complete, but remember to be kept on the list of students, you do need to have an about me page or post completed. Hello there I have done an avatar thanks to you 🙂 yay!!!! I’m sorry for the confusion on my blog. I chose a new theme and I think that the pages will work with it this time. I also did activity 8 and 9. Thank you for making it possible for us to be a part of The Student Blogging Challenge 2015. My class has been preparing for this challenge by learning how to use blogs for learning since the beginning our school year last September. They have now set up their individual blogs and are learning how to use them to share their learning. Thank you for making our learning so fun, and for connecting us to the world. Thanks very much for allowing your students to take part in the challenge each year. I certainly hope they find the activities fun yet challenging for some of them. I did activity number one and two. I also just sent my All About Me post to my teacher so that you can see it as soon as possible.